Modern restorative dentistry necessitates the application of the concept of conservatism to achieve durable, long-term and successful restorative treatments. Cuspal coverage designs used for the restoration of endodontically treated posterior teeth can offer a good alternative to the conventional full coverage approaches and it is clearly supported by the latest evidence. Modern resin composites can offer excellent aesthetic potential and acceptable longevity with a much lower cost than equivalent ceramic restorations. 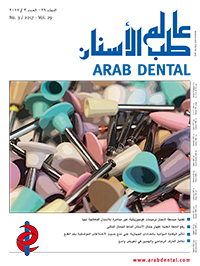 The aim of this article is to present a novel and simplified chairside indirect restorative technique using a modern esthetic resin composite system for restoring endodontically treated posterior teeth in a single visit. Beiruti, N. / Stork, M.
Human body requires certain essential elements in small quantities and their absence or excess may result in severe malfunctioning of the body. These essential trace elements directly influence the metabolic and physiologic processes of the organism. Diet and nutrition affect oral health in a variety of ways with influence on craniofacial development and growth and maintenance of dental and oral soft tissues. The essential micro-nutrients are cobalt, copper, chromium, fluoride, iron, iodine, manganese, molybdenium, selenium, zinc, in addition to vitamins, minerals and antioxidants. If the treatment objective is to improve aesthetics in the anterior region, therapy is usually required where the intraoral hard and soft tissue is inadequate. These deficits are, however, often associated with problems involving aesthetics of the lip that are generally not factored in by the dental team. A predictable technique has been used in plastic surgery for decades in these cases, i.e. the upper lip lift. If the upper lip has again been restored to its optimum position, the results produced by the dental and dental technical team are also fully visible in the form of a youthful smile. With the introduction of this minimally invasive surgical technique in practical dental medicine, patients can benefit from a comprehensive orofacial approach in planning the aesthetics of the anterior teeth. Intrusive luxation is a severe trauma-related event with a high frequency of pulp necrosis and root resorption. A common complication following intrusion is tooth ankylosis, which can extend to progressive replacement root resorption. Decoronation is a new conservative treatment for cases of tooth ankylosis in young patients who have not finished growing. The purpose of this article is to report a multidisciplinary case of a young patient with anterior open bite, dental ankylosis, and tooth infraposition affected by intrusive luxation. The purpose of this study is to assess the beneficial or harmful effects of systematic prophylactic antibiotics at extraction of teeth, apart from third molars, vs no antibiotic or placebo administration. Furthermore, if antibiotics are beneficial, to determine which type, dosage, duration and timing of administration is the most effective. The conclusion of the authors is that there are no randomized controlled trials to determine if the antibiotic therapy is necessary at extraction of teeth, excluding third molars. Magne, P. / Schlichting, L. H.
Using the example of a comprehensive restoration in the upper and lower jaw, dental technician Björn Czappa explains how the materials of glass and hybrid ceramics can be combined in a single restoration, and the esthetic results that are possible with this technique. In this case study, he also shows how VITA ENAMIC crowns can be characterized with light-curing stains to reproduce the esthetics of natural teeth. Life's getting easier - the choice of materials has now become a multifaceted matter in the dental laboratory. Dental technicians are constantly being confronted with new materials, whose development in many cases enables more advanced types of dental restorations. Hans-Jürgen Joit presented the Celtra workflow during an event held by Dentsply Sirona. The following article contains extracts of his presentation.